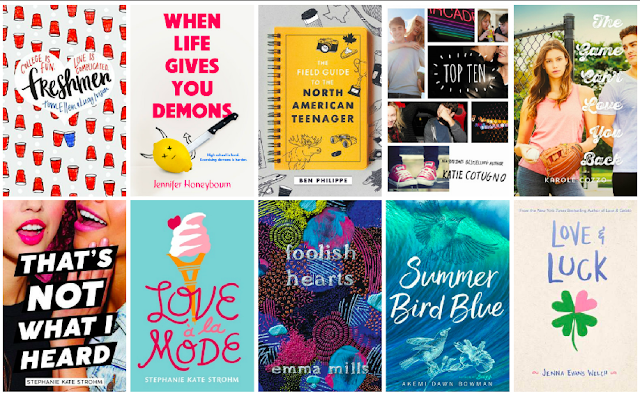 We Live and Breathe Books: Top Ten Tuesday: May I Have Some More? This week we are talking about standalone books, that we wish had a sequel. I am a BIG contemporary reader, so most of the books on my read-shelf are standalones, and these sequels I am envisioning went one of two ways. Some of these stories had room to grow, or I just hated the ending. I would love to continue the story from the first book, but others would spawn companions, which feature other characters from that world. As always, my list is made up of books I loved and read within the past year. What book do you wish had a sequel? LOVE the title for When Life Gives you Demons! I really want to read more university fiction after enjoying Fangirl last month so I am going to try Freshers and it would be so cool if it did get a sequel!! Demons was fun, and there are more demons out there, so why not a sequel? My biggest problem with Freshers was that I felt like they were just getting started with some great things, when the book ended. It's college. Let's go through the whole experience with them. I'll have to check some of these out, never heard of them but the covers are awesome! I am so with you on giving other characters their own story for Love a la Mode. There was a strong set of secondaries in that one. I like the Give the other characters their own story idea, especially for Foolish Hearts! Or pretty much all of Emma's books! Emma Mills writes the best characters. I would take any of them in their own book. Oliver is my go-to when I want to express wanting more. some of my faves up there. Nice picks! All are absolutely new to me ones! Lol. I agree with Love a la Mode - I feel like the story took place over a relatively short period of time, and I'd be interested to know what happens to the students in the next semester. I was ok with the ending of that book, but I would love to get to know more of the characters better, because the book was jam packed with interesting people. Most of these are new to me. I could put together a pretty long list for this myself. This was a harder topic than I thought it would be. At first, I just kept thinking about books I hated the endings of, but then I realized not all should necessarily be extended. I like how you separated the "continue the story" ones from "give characters their own story." I think there are some universes with other characters that have stories that should be told too. Look, I can finally not be ashamed when I see a Akemi Dawn Bowman title on your list. I finally picked up Starfish! Now I need to make time for Summer Bird Blue. I wouldn't mind continuing Kiko's story, because she was just starting to come into her own at the end there. Summer Bird Blue is a great choice. I'd love to see some of the other characters get spin off books. Kai was a really interesting character, and I would love to get his whole story. A book set in the past based on George would be great too. Philippe is hilarious. I loved meeting Norris so much, and the book ending with him sort of starting over. I would like to see how it all worked out. The vast majority of my books are part of series, mainly due to reading a lot of urban fantasy and apocalypse over the years. Most of my stand-alone books are horror I think. That 1968 musical version is the best though. I'm playing catch-up from last week, but I totally agree with Top Ten! I'd love to see a sequel to that one! You know I fumed over that ending. I mean it's very Cotugno, but I needed more, much more. Oddly enough, I sort of felt that way about all her books, which is why I was so overjoyed to get the amazing sequel for 99 Days. I was thinking any of the freshmen could carry a story, and I would be able to get an update on Teddy and Kim.